What happens when fast-food and designer settings collide? The Rise of online sales coupled with rent hikes mean that many conventional brick-and-mortar retailers continue to struggle or are dropping away completely. Recent casualties include Phones4U, La Senza, Blockbuster and Albemarle & Bond. 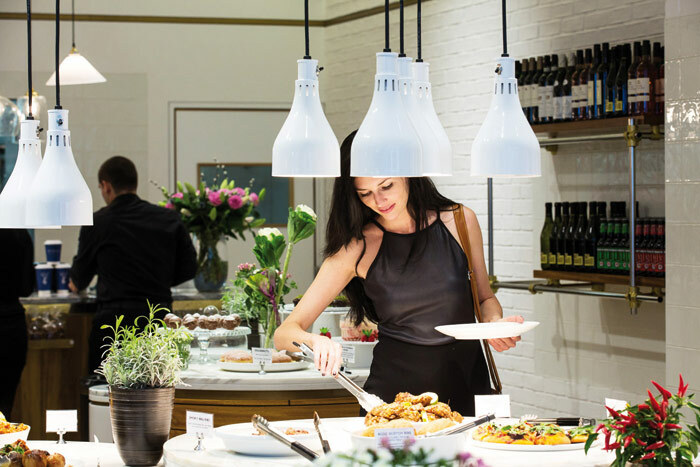 This trend is highlighted in our Bars and Restaurants Focus, which demonstrates that as the sector becomes increasingly crowded existing operators are upping their game and new entrants hope to make a splash with ever-more specialised offers. So a large chain of garden centres - hardly a sector synonymous with fabulous eating experiences - has introduced a top-notch cafe format in the hope, no doubt, that it will become a destination as much as its garden products; an old-fashioned whisky retailer has a new owner that hopes to reinvent brown spirits and inspire drinkers with a hidden bar; and a 300-year-old grocer's is making its restaurant debut in that epitome of modern dining, the airport. Meanwhile many operators in the 'fast casual' category and those with 'premium casual' venues are watching with alarm as their two worlds collide. The emerging sub-set is being labelled 'fast premium', and it seems to go against everything that restaurant designers hold dear. These places are positioned to teach well-heeled diners that good food and speedy service comes at a price, with convenience being the buzz-word. Will it take off, or do traditional restaurateurs still believe that diners prepared to pay for the privilege should be allowed to linger? What happens when the term cash-rich time-poor manifests itself on the high street? The answer seems to be a crop of businesses keen to part deep-pocketed consumers with their money in the shortest amount of time possible. Traditionally, highly priced offers have been associated with a long dwell time. Think of the hours whiled away in posh hair salons and over long, luxurious lunches. But that trend is being bucked, now that the current Holy Grail of convenience has been added to the mix. Some people, these business owners believe, are just too busy to take things slowly. What they want is a quick, well-executed, good-quality fix. Hence the rollout of Blow, a 'fast beauty' hair, nail and make-up salon aimed at women with hectic lives who like that just-applied look. The concept, launched by venture capitalist Dharmash Mistry and Grazia's founder editor Fiona McIntosh, and designed by Caulder Moore, promises to buff and coif women in a matter of minutes. This macro trend, believes Mistry, will be based on 'increasingly time-poor, busy consumers who juggle many things' and the 'reinvention of high streets and consumer expectations of convenience'. The restaurant sector has also spotted the appeal of this approach. The first brand to really embrace it was Five Guys in the USA, which now has a handful of outlets in London. Its restaurants serve good-quality burgers - though no novelty in that as American and European towns are littered with similar concepts, including Byron by Michael Boyd Associates. But two diners at Five Guys can expect to spend just 15 minutes buying and eating a burger and chips washed down with a Coke, and will pay a total of £28 for the privilege - that's three times as much as McDonald's charges for the same express experience. 'When you analyse their pricing and speed of service it's a freakish model, but it is very successful,' says Jon Blakeney, group managing director of London design agency I-AM. Such speedy offers as Five Guys benefit from fast and furious service with a smile, and an interior design concept that lends itself to a quick turn-around. These places need to be durable, with lots of hard surfaces. That means floors that can be mopped, tiled walls, booth-style and fixed seating, so that staff don't waste precious time realigning the chairs after customers have left. I-AM's design for Ethos in London's West End applies many of these rules. The premium buffet is vegetarian by stealth - the menu excludes meat but doesn't crow about it. Customers load up a plate from teak drum pods whose marble tops display the food like jewellery. The plate is then weighed and payment calculated accordingly. At I-AM's Ethos diners select their food from marble-topped team drums. Such concepts obviously work well on busy streets and in transport hubs, and airports have had their own 'bar' version for some time. 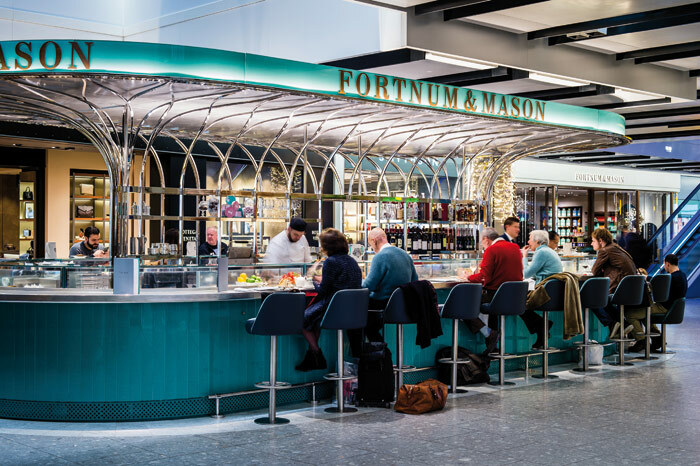 A new offer is Fortnum & Mason's The Bar at Heathrow Terminal Five. 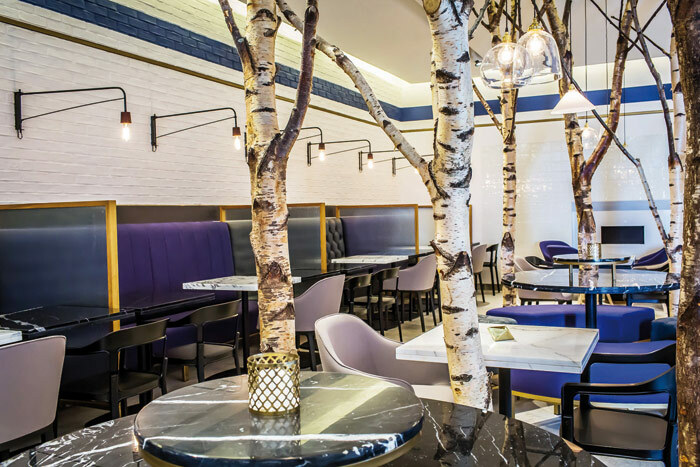 The menu - including delights such as parfait of Foie Gras with toasted brioche for £20 -is served in a suitably upmarket environment, designed by Universal Design Studio. 'The bar is shaded along its length by a stunning freestanding canopy structure which references English silverware,' explain the heads of the studio Jay Osgerby and Ed Barber. Whether other restaurant operators dare to follow Five Guys remains to be seen. But that's one format that seems to be unstoppable: it has more than 1,000 locations in the USA and another 1,500 units in development.